“When my cows die, I bury them like I would a family member. I can never sell them,” says Balashanmugam, distantly looking at his fenced cattle. For him, the possibility of sold cows changing hands to slaughter houses in Kerala is the biggest fear. Balashanmugam literally waits till the cows come home. The 68-year-old farmer, with a family strength of three, owns over 50 Umbalacherry cattle. And he waits for the cows to return from grazing. Like him, an entire panchayat waits for the cows to come home. Welcome to Umbalacherry panchayat — the home tract of Umbalacherry breed of cattle, here in Thalainayar. Often seen as the pride of Tamil Nadu, the draught cattle is a boon to marshy soils due to its sturdiness and ability to labour for long hours, with little feed. And here, each of the 690 households of Umbalacherry panchayat own not less than two cows; and some as many as 25 and 50. “For us, it is important not to borrow even cow dung. And therefore, we have at least one or two cows in our homes, says J. Selvaraj, a resident. Mr. Selvaraj, of course owns 25 of Umbalacherry breed. 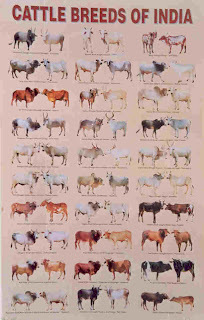 Largely called Umbalacherry, the cattle come under different family trees, with interesting names like “Ganapathy iyer maadu,” “Suryankaadu maadu,” “Aatukaari maadu,” “Maariyapillai maadu,” and “Vannaan maadu.” These names were possibly derived from the early breeders, and have sustained many moons. There is a sing-a-song tone to the morphological description of the breed. Its “Venkozhumbu (white stockings), Nethipottu (white diamond on the forehead) and Vidivaal (tufted tail end)” is the trademark of the cattle breed, says Mr. Selvaraj. A few km from Umbalacherry is the government cattle farm in Korkai in the neighbouring Tiruvarur district where a few thousand Umbalacherry cattle are bred. The farm holds auctions for bulk buyers. But, this is a serious concern for the traditional Umbalacherry cattle breeders. “During the last such auction, some buyers from Kerala had purchased the cattle. We intervened, recovered the cattle and handed them over to a Goshala in Mayiladuturai,” says V. Deenadayalan, General Secretary, Umbalacherry parampariya Kaalnadai Valarppu Sangam (Umbalacherry traditional cattle breeders association). The government farm at Korkai is severely understaffed, and they could just about manage the breed. We have been demanding that auctions be shelved and individual cows and bulls be sold to farmers. This would make it affordable, says Mr. Deenadayalan. Apart from draught purposes, Umbalacherry cow produces top quality milk even if it does not exceed 2.5 litres per day. This is at no maintenance. The cattle do not require any special feed and the grazed fodder is enough for it to sustain through the day, says Mr. Balashanmugam. Today, it has become increasingly difficult to breed in the absence of grazing lands. Umbalacherry panchayat was allotted over 107 acres as exclusive grazing grounds during the British rule. However, the grazing lands fell under encroachment by way of marginal farming. Though a court order was sought and orders eventually passed to vacate the encroachments, no action has been taken yet. The cattle hold the consciousness of the people here. The beauty of the Umbalacherry cattle is that it resembles a deer calf, and is reddish brown in colour until few months after birth. Heifers onwards, the cattle change colour to dark shades of grey, says Mr. Deenadayalan.